Thunderhead Mountain is a 5,527-foot (1,685 m) mountain in the west-central part of the Great Smoky Mountains, located in the Southeastern United States. Rising along the border between Tennessee and North Carolina, the mountain dominates the Western Smokies. The Appalachian Trail crosses its summit, making it a popular hiking destination. 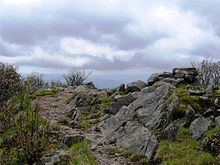 Rocky Top, a knob on the western part of the mountain's summit ridge, shares its name with a popular Tennessee state song. Blount County, Tennessee / Swain County, North Carolina, U.S.
Thunderhead rises approximately 3,500 feet (1,100 m) above its northern base at Little River and approximately 3,000 feet (910 m) above its southern base at Bone Valley. The mountain consists of three peaks, the lowest being Rocky Top at 5,440 feet (1,660 m) above sea level and the easternmost being the highest at 5,527 feet (1,685 m) above sea level. 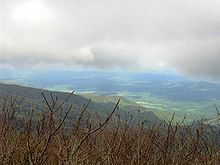 Thunderhead is the highest point in Blount County, Tennessee and the highest point on the Appalachian Trail coming from the south until the trail ascends Silers Bald (5,607 ft) some 10 miles (16 km) to the east. "As we proceeded in a near-gale to Rocky Top, the first of the three major peaks of Thunderhead, Sam remarked, "It'll be thunderin' and lightnin' on Thunderhead when it's clear on every other peak on top o' Smoky, and that's how hit got its name." Thunderhead consists of precambrian sandstone. Thunderhead sandstone is part of the Ocoee Supergroup, which was formed from ancient ocean sediments between 500 million and one billion years ago. The mountain itself was formed appx. 200 million years ago during the Appalachian orogeny, when the collision of the North American and African plates thrust the rock upward. Rocky Top, with its characteristic sandstone boulders. James Spence, who cleared the ridge two miles (3 km) to the west (now known as Spence Field), was the first known permanent settler in the vicinity. While the extent of Spence's farm is unknown, cattle-grazing had rendered Thunderhead a grassy bald by the late-19th century. The view from Rocky Top, looking northwest. Thunderhead is one of the few mountains listed under its current name in Arnold Guyot's 1859 survey of the crest of the Smokies. Guyot measured Thunderhead's elevation at 5,520 feet (1,680 m) above sea level, missing the modern measurement by just seven feet (2 m). During the Civil War, a group of East Tennesseans attempted to form a wilderness settlement on the mountain's north slope known as "New World," although the settlement didn't last. The settlement was located along Thunderhead Prong, near Chimney Rocks. As preservationist groups began buying land in the Smokies in the early 1900s, Thunderhead became a favorite hiking destination for park visitors. John W. Oliver, the great-grandson of the first European settlers in Cades Cove, started offering guided hikes to the mountain in 1924. The trail he (and Thornborough's guide, Sam Cook) used largely followed the Bote Mountain Trail-Appalachian Trail route still in use today. In the years after the Great Smoky Mountains National Park was formed, wooded plants started to reclaim much of the Smokies crest west of Clingmans Dome. Park strategy at present is to allow Thunderhead to return to its natural state. 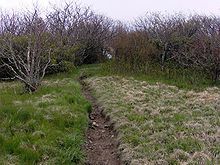 A narrow path is maintained across the top of the mountain for Appalachian Trail thru-hikers. The Appalachian Trail approaching the summit of Thunderhead Mountain. The Bote Mountain Trail, with its trailhead on Little River Road, ascends seven miles (11 km) to the crest of the Smokies and intersects the Appalachian Trail at Spence Field. From Spence Field, it is approximately two miles to the summit of Thunderhead. The Lead Cove Trail, also beginning on Little River Road (near Cades Cove), offers the shortest access to the summit by bypassing the first 4 miles (6 km) of the Bote Mountain Trail. From the Lead Cove trailhead, it is approximately 7 miles (11 km) to the summit of Thunderhead. The Anthony Creek Trail, rising out of the Cades Cove campground, also bypasses the first 4 miles (6 km) of the Bote Mountain Trail. From the Anthony Creek trailhead, it is approximately 7.5 miles (12 km) to the summit of Thunderhead. While the main summit of Thunderhead is covered in foliage, Rocky Top offers a 360-degree view of the western Smokies. ^ a b "Thunderhead Mountain, North Carolina/Tennessee". Peakbagger.com. ^ a b Robert Mason, The Lure of the Great Smokies (Boston and New York: Houghton-Mifflen, 1927), p. 56. ^ Laura Thornborough, Great Smoky Mountains (Knoxville: University of Tennessee Press, 1942), p. 143. ^ Harry Moore, A Roadside Guide to the Geology of the Great Smoky Mountains National Park (Knoxville: University of Tennessee Press, 1988), p. 32. ^ Harry Moore, A Roadside Guide to the Geology of the Great Smoky Mountains National Park (Knoxville: University of Tennessee Press, 1988), pp. 26-27. ^ Durwood Dunn, Cades Cove: The Life and Death of An Appalachian Community (Knoxville: University of Tennessee Press, 1988), p. 43. ^ a b Carson Brewer, Great Smoky Mountains National Park (Portland, Ore: Graphic Arts Center Publishing, 1993), p. 21. ^ Durwood Dunn, Cades Cove: The Life and Death of An Appalachian Community (Knoxville: University of Tennessee Press, 1988), p. 243. ^ Daniel Pierce, The Great Smokies: From Natural Habitat to National Park (Knoxville: University of Tennessee Press, 2000), p. 178. Wikimedia Commons has media related to Thunderhead Mountain.